First off, I was actually able to enjoy Thanksgiving dinner with a few friends this year. My mom’s gift did not go uneaten and I’m so grateful that she sent it. However, when I was invited to my friend’s Thanksgiving and I asked what I should bring, I got a shock. Bring the stuffing? Bring the stuffing? Are you kidding me? That’s like saying “Bring the turkey.” Sacred ground not to be walked on unless you’re the hostess. Little to their knowledge, I don’t do Stovetop for big events. I don’t even make stuffing myself. That’s my aunt’s job. 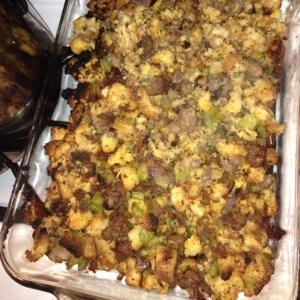 So I did what any good volunteer stuffing bringer would do, I looked up recipes. But I couldn’t figure out what I wanted to make, so I combined a few recipes. Picked up both stuffing bread and cornbread at the store, then decided I wanted sweet Italian sausage, and snagged a red onion and some celery from the produce department. What can I say, when all else fails, just pick the food you want, cook it together, and hope for the best. I kinda followed the recipe. I diced the bread up and toasted it (burning only a portion of it), browned the sausage, and mixed it all together. And then the big moment came. The tasting. I have to admit, my heart stopped a bit while I waited for the response. . . all fantastic! They loved it. For my first go, I have to say, I’m impressed and I can’t wait to make it again. Preheat oven to 300 degrees F. Place diced white bread on one cooking sheet, the cornbread on another. Bake white bread for 20 minutes or until toasted, turning half way. Bake cornbread for 25 minutes or until toasted, turning halfway. Set aside in a large bowl and let cool. Adjust oven temperature to 375 degrees. In a saucepan, brown sausage. Remove and drain fat. In the same saucepan, melt the butter. Add onions, celery, and 1/2 teaspoon of salt and 1/2 teaspoon of pepper. Cook, stirring, until vegetables are soft, about 8 minutes. In a large bowl, whisk together broth and eggs. Pour over the bread. Add vegetables, sausage, and herbs; toss to mix. Transfer stuffing to a baking dish. Bake covered for 25 minutes. Remove cover and cook for another 20 minutes or until top is browned. Remove, serve, and enjoy.